General Info The Roaming Knights of Tennessee is a virtual chess club -- we have no meeting place as yet. Players joining this club will be able to email each other with the ultimate goal of forming a real CXR-affiliated club. 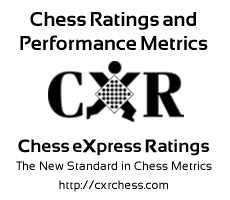 You will, as a member, be able to play in CXR-rated events. However, your 1-year CXR membership will remain intact until your first CXR-rated game is reported. Ask your local tournament director to use CXR, as there is NO COST for TDs to do so.